The news out of Japan is that Canon is contemplating getting out of the low-end compact camera business, basically all cameras under 20,000 yen (~US$200). To put that into context, that would be all the Powershot A#### models (7) and all Elph models (7). Four of those 14 models are currently listed as “new” on Canon’s site. 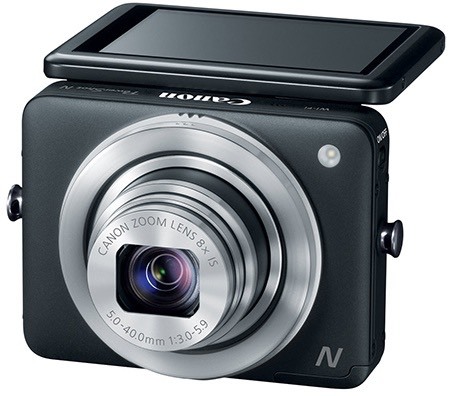 That would appear to leave the Powershot N (and N100) as the low-end of Canon’s lineup, and I find that interesting, because of all the low-end compact cameras, the N probably comes the closest to being able to live well in the smartphone world (it’s highly connected, especially the Facebook model). Other than its odd shutter release (ring around the lens, corrected with the N100 model), this stylish camera provides what most smartphone users want in a smartphone camera up sell: very small (purse-able, also designed to be hung as a "necklace"), zoom lens with a bigger sensor, ability to operate independently as a camera, but also can seamlessly transfer your images to Facebook, other social networking sites, or your personal computer (via Canon CameraWindow app and in some cases Canon iMage Gateway [that’s their capitalization, not my typo]). More so than any other camera I’ve seen except perhaps the Samsung NX30, Canon has done a good job of trying to bring the workflow over to the camera. You can have frequently used devices and accounts in the camera so that a “share” is a tap on the camera’s screen. Canon more so than any of the other compact camera makers seems to be taking more of a “if you can’t beat them, join them” approach towards smartphones at the moment. Whether that’s enough to keep the rest of their compact line alive remains to be seen. What Canon’s new compact lineup looks like is this: waterproof cameras, cameras with huge focal length ranges, the N series I just described, and the very high end G1x and G## cameras. The only problem with this type of retreat is that it’s putting more and more pressure on a narrower price range of cameras (basically US$300 to US$800), a range that now includes everyone's remaining compact cameras, mirrorless cameras on closeout sales, and in the upper end, both new mirrorless and DSLR cameras. I’m not so sure that this wouldn’t be the first of a series of staged retreats. Let me put it another way, in that US$300 to US$800 price range, Canon currently has 21 different choices. I would say that’s about twice as many as is likely really needed, and in virtually all of them there are clear deficiencies that still need to be addressed. What I wrote about Canon applies in spades to Nikon: 30 different choices in a narrow window. Model proliferation is usually the last stage before market contraction in high tech. Canon isn’t the first to make a withdrawal at the low end. Fujifilm, Olympus, and Panasonic have already made similar comments, and Casio recently has done the same. Pentax executives have been quoted as saying the company is just concentrating on waterproof and high-end compact cameras, which brings us back to Nikon, the lone hold-out in the model reduction campaign. As it is during the last decade Nikon has gone from being #5 in compacts to #1 in terms of unit volume and are the winners of a what may end up a Pyrrhic victory. Last one out should close the door. But you have to get out first ;~).